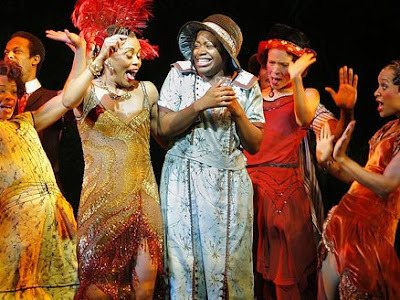 After 940 performances and grossing over 103,000,000 The Color Purple is shutting down production on Broadway. The show will still continue to tour so that others can experience Alice Walker's American masterpiece. The current installment of the play The show currently stars Chaka Khan as Sofia, BeBe Winans as Harpo, LaKisha Jones as the Church Soloist at all evening performances and Sofia at all matinee performances, Montego Glover as Nettie, Elisabeth Withers-Mendes as Shug Avery, Alton Fitzgerald White as Mister, Krisha Marcano as Squeak and Zonya Love as Celie. The word is that Fantasia's exit two weeks ago may have caused an early demise for the show even though some heavy hitters (Khan and Winans) still remain. Oprah Winfrey made this statement when the closing was announced "When the opportunity came to help bring the musical to the Broadway stage, it was a full circle moment for me," she added. "I'm so proud to have been a part of this production that not only made Broadway history, but resonated with a new generation and touched the lives of more than 1 million theatergoers." Although I never made it to "The Great White Way" to see the show I sure hope it comes to the Dallas area because from what I heard it is very entertaining. Eddie said that he saw it in Chicago and that it was really good. I have a feeling that "The Color Purple" will get the "Hairspray treatment" and be remade as a big screen musical. What do you think? I've never seen it, but the people that I know that have said it was wonderful! I really need to get to the theater more. The last one I saw was "Cats". I've been anxious to see Wicked, too. Someday! Hey Malcolm, If Eddie saw "The Color Purple" in Chicago he saw the one with Latoya London (From season 3 of AI) portraying Nettie. I could see the show becoming a big screen musical, but with Oprah presenting it I would venture to guess that it might end up on television. However, the production is probably too big for TV. I will be interesting to see what happens. Jessica, I am trying to remember when I saw my last play. I think it was either "Beauty Shop" or "Your Arms to Small to Box with God" back in the 90's. I did see a revival of "Dreamgirls" on Broadway in the late 80's. I loved the movie, I hope I get the opportunity to see the play as well.